A water circulator is a powerful tool for fighting stagnation in ponds. In warmer weather, we have found them to be very good at circulating oxygenated water into more shallow coves and "hard to reach" places where a typical aerator would never cover very well. You may also see them used as a deicer during the winter months. 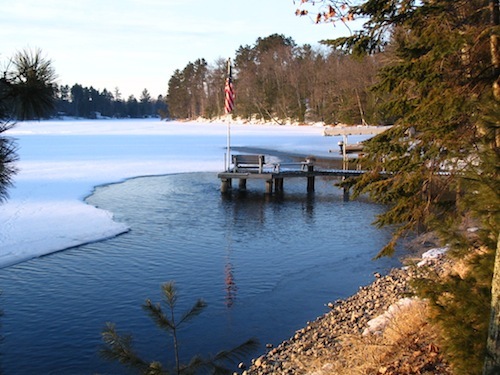 They are particularly good at keeping an area of water open around boat docks, ramps, marinas, and decks, and they guard against ice damage that can often result from the pond or lake freezing over. A water agitator is really quite simple by design. It uses a specially designed propeller, which is connected to a motor, and suspended under water or horizontally under a float. Mounting and placement is quite simple using two included 20' suspension ropes. An optional dock mount attachment is also available. An optional time and temperature controller is available as well, to help keep operational costs in line. During winter use, the thermostatically controlled temperature sensor will only turn the circulator on whenever freezing conditions exist. Rugged Motor: Environmentally friendly design with a hard-face internal mechanical seal for protection against leaks. Long-life top and bottom ball bearings. Flood oil lubricated for excellent heat dissipation. All models include a float and two (or three) 50′ braided nylon mooring ropes and are available with 50′, 100′, 150′, or 200′ (250′, 300′, 400′, or 500′ for 240V models) SJTOW underwater rated electrical power cords.